İngilizce sınıflarında ana dil kullanımı tartışmalı bir konudur ve kullanılıp, kullanılmaması hususunda kesin bir araştırma sonucu bulunmamaktadır,fakat şu da yadsınamaz bir gerçektir ki bazı öğretmenler ana dili kullanmaktan kaçınırken, bazıları da çeşitli sebeplerden ötürü ana dil kullanımına sıcak bakmaktadırlar. Bu çalışmanın amacı, ingilizcenin yabancı dil olarak öğretildiği ortamlarda, ana dil kullanımının işlevlerini ortaya koymaktır. Bu çalışmaya, Türkiye’de bir devlet üniversitesinde çalışan 4 İngilizce öğretmeni ve burda eğitim gören 20 öğrenci katılmıştır. Veri ders saatlerinde kaydedilmiş olup, dil değiştirmeye dair 129 örnek içermektedir. Bu küçük ölçekli dil değiştirme araştırmasının sonucu, ana dil kullanımının genellikle pedagojik amaçlara işaret ettiğini gösterir. The use of mother tongue (L1) in English as a Foreign Language (EFL) context is a controversial issue and there has been no absolute research outcome that indicates whether it should be avoided at all costs or not, but it is an incontrovertible fact that while some of the teachers avoid using mother tongue in language teaching classroom as they thought that using L1 hinders the target language (L2) acquisition, the others favor it for variety of reasons. The aim of this study is to identify the functions of L1 use in an EFL setting. Four English teachers and 20 students studying at a state university in Turkey were involved in the study. The data consists of 129 instances of code-switching which were recorded during the actual teaching hours. The findings of this small-scale investigation of code-switching suggest that the use of L1 generally denotes pedagogical purposes. Ahmad, B. H. & Jusoff, K. J. (2009). Teachers’ code-switching in classroom instructions for low English proficient learners. English Language Teaching, 2 (2), 49-55. Anton, M. & Dicamilla, F. J. (1999). Socio-cognitive functions of L1 collaborative interaction in the L2 classroom. The Modern Language Journal, 83 (2), 233-247. Duff, P. A. & Polio, C. G. (1990). How much foreign language is there in the foreign language classroom? The Modern Language Journal, 74 (2), 154-166. Eldridge, J. (1996). Code-switching in a Turkish secondary school. ELT Journal, 50 (4), 303-311. Greggio, S. & Gil. G. (2007). Teacher’s and learners’ use of code switching in the English as a fo- reign language classroom: A qualitative study. Linguagem & Ensino, 10 (2), 371-393. Grim, F. (2010). L1 in the l2 classroom at the secondary and college levels: A comparison of func- tions and use by teachers. Electronic Journal of Foreign Language Teaching, 7 (2), 193-209. Gulzar, M. A. (2010). Code-switching: Awareness about its utility in bilingual classrooms. Bulletin of Education and Research, 32 (2), 23-44. Gumperz, John J. (1982). Discourse strategies. Cambridge: Cambridge University Press. Guthrie, L.F. (1984). Contrasts in teachers’ language use in a Chinese-English bilingual classroom. In J. Handscombe, R. A. Orem, & B. P. Taylor (Eds. ), On TESOL ‘83: The Question of Control (pp. 39-52) Washington, DC: TESOL. Iqbal, L. (2011). Linguistic features of code-switching: A study of Urdu/English bilingual teachers’ classro- om interactions. International Journal of Humanities and Social Science, 1 (14), 188-194. Jamshidi, A. & Navehebrahim, M. (2013). Learners’ use of code switching in the English as a foreign language classroom. Australian Journal of Basic and Applied Sciences, 7 (1), 186-190. Jingxia, L. (2010). Teachers’ code-switching to the L1 in EFL classroom. The Open Applied Lingu- istics Journal, 3, 10-23. Jingxia, L. (2008). How much the first language is there in teachers’ talk in EFL classroom? The Open Applied Linguistics Journal, 1, 59-57. Jingxia, L (2009). Switching to L1 in the EFL Classroom- the perspective of adaptation. The Open Applied Linguistics Journal, 2, 45-49. Kao, P.L. (2010). Examining second language learning: Taking a sociocultural stance. ARECLS, 7, 113-131. Kayaoğlu, M. N. (2012). The use of mother tongue in foreign language teaching from teac- hers’ practice and perspective. Pamukkale Üniversitesi Eğitim Fakültesi Dergisi, 32, 25-35. Lantolf, J. & Thorne, S. L. (2007). Sociocultural theory and second language learning. In. B. van Patten & J. Williams (Eds. ), Theories in Second Language Acquisition (pp. 201-224). Mahwah, NJ: Lawrence Erlbaum. Lee, H L J. (2010). Code switching in the teaching of English as a second language to secondary school students. Malaysian Journal of ELT Research, 6, 1-45. Mackey, A. & Gass, S. M. (2005). Second language research: Methodology and design. Mahwah, NJ: Lawrence Erlbaum Associates. Meyer, H. (2008). The pedagogical implications of L1 use in the L2 classroom. Maebashi Kyodai Gakuen College Ronsyu, 8, 147–159. Moghadam, S. H., Samad, A. A., & Shahraki, E. R. (2012). Code switching as a medium of instruc- tion in an efl classroom. Theory and Practice in Language Studies, 2 (11), 2219-2225. Moran, G. (2009). Teachers’ code switching and its functions in foreign language classrooms. Master’s thesis, Marmara University, İstanbul, Turkey. Qian, X., Tian, G., & Wang, Q. (2009). Codeswitching in the primary EFL classroom in China— two case studies. System 37, 719-730. Rezvani, E. & Eslami-Rasekh, A. (2011). Code-switching in Iranian Elementary EFL Classrooms: An Exploratory Investigation. English Language Teaching, 4 (1), 18-25. Riegelhaupt, F. (2000). Codeswitching and language use in the classroom. In A. Roca (Ed. ), Research on Spanish in the United States: Linguistic issues and challanges ( pp. 204- 217). Summerville, MA: Cascadilla Press. Sankoff, D. and Poplack, S. (1981). A formal grammar for code-switching. Papers in. Linguistics: International Journal of Human Communication, 14, 3-46. Schumm, J.S. (Ed.). (2006). Reading assessment and instruction for all learners. New York: Guilford Press. Şenel, M. (2010). Should foreign language teaching be supported by mother tongue? Journal of Language and Linguistic Studies, 6(1), 110-120. Üstünel, E. & Seedhouse, P. (2005). Why that, in that language, right now? Code- switching and pedagogical focus. International Journal of Applied Linguistics, 15(3), 302-325.
: shows the teacher’s CS. inaudible]: For the parts that can’t be heard. ISNAD TİMUÇİN, Metin , BAYTAR, İlknur . "İNGİLİZCE YABANCI DİL SINIFLARINDA ANA DİL KULLANIMININ İŞLEVLERİ: BİR YABANCI DİL SINIFINDAN YANSIMALAR". 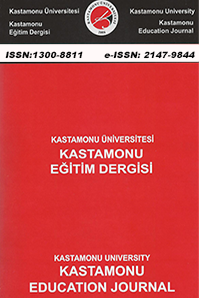 Kastamonu Eğitim Dergisi 23 / 1 (January 2015): 241-252.